It has been more than a few weeks since I last visited a gallery, and so I was quite interested to see what the newly refurbished Musee Picasso was like. The museum has been closed for renovation work for the last five years and recently re-opened (I and I am sure you can read elsewhere how the renovation work went, but I won’t go there today). It is one of the largest of the Hotel Particuliers (The Hotel Salé) in the Marais, and many different tenants have lived in this building since it was constructed. The original owner, Pierre Aubert, was too friendly with Nicolas Fouquet and Foquet’s fall from grace took Aubert with him. 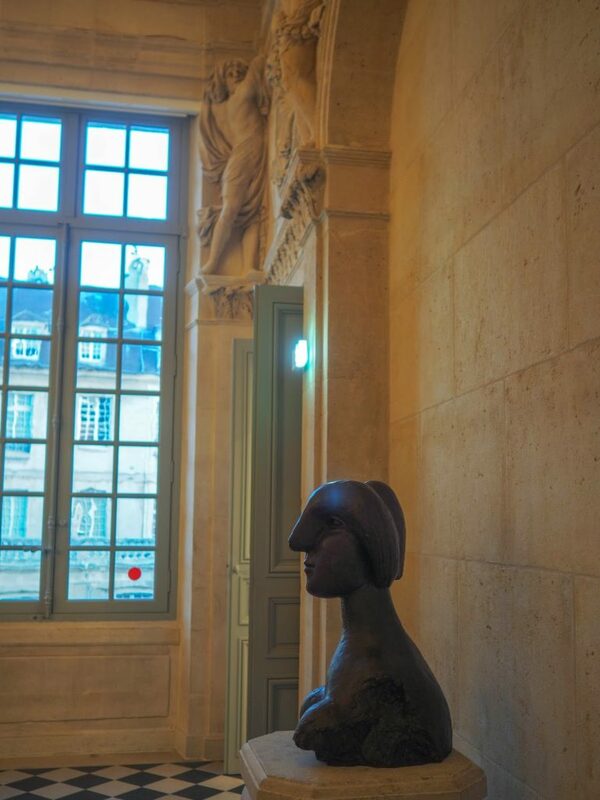 The Musée Picasso has been there since the 1980s, and I think I visited a few times before the refurbishment (the building became the property of the Ville de Paris after the last descendants of the building’s owners died in the1960s). I arrived at the “new” building with ML sometime after 5pm last Saturday and there was still a small line in cour d’honneur waiting to enter in the building but nothing too terrible. The stones of the courtyard seemed to have been scrubbed to within an inch of their lives, and if a three-hundred-year-old building could look new, this one did. Inside, it seemed that every square metre of the building had been converted to exhibition space. 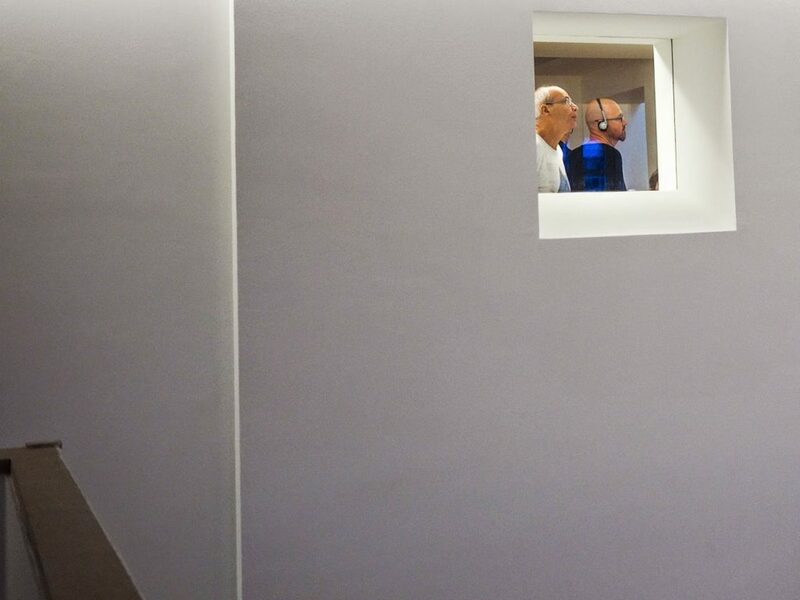 For the most part, building walls had been obscured behind white panelling: necessary, I think because Picasso’s works belong resolutely to the 20th century. The museum’s stairs have been left unchanged, and are magnificent. The stucco and statues on the ceiling are as beautiful as ever. However, in what seems like a wilful act on the part of the Museum’s curators, to remind us of Picasso’s modernity, one of Picasso’s sculptures of a woman (a particularly ugly sculpture it has to be said) has been placed on a stone plinth at the head of the stairs, just before one enters the second-floor exhibition space. Just to remind you. I am, it has to be said, not a fan of all of Picasso’s work. There is no denying however the staggering variety of his work and the sheer creative energy he displayed throughout his life. One is always astounded by the vast range of works that he created and that how that he perfectly mastered every different style that he worked in. Most artists only manage to master one or two different registers throughout their careers. It is also amazing to think that one man alone managed to create enough works to fill an enormous space like the Hotel Salé. I don’t think Picasso spent many days on the sofa watching the TV that is for sure. I will admit that my favourite part of the museum no works of Picasso exhibited. It is in a tiny space, under the roof. There are two or three windows which give a views over the jumbled Parisian rooftops. It is a cosy, intimate space. 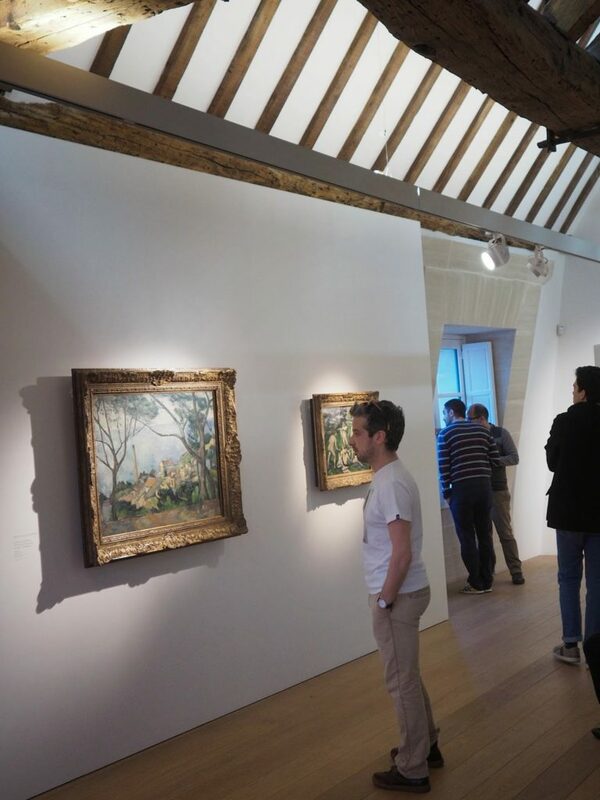 In there, on the walls, are a few of Cezanne’s paintings which were in Picasso’s private collection. One can contemplate these paintings and then take one or two steps and stare out across the Paris skyline. I imagine that in the tall old Marais buildings that one can see from the window there are attic rooms like this one, looking back towards the Hotel Salé. I wonder what they are like, and what is inside them. An hour slipped by, and soon enough hidden loudspeakers announced it was time to leave. We made our way down the stairs to the exit, visiting rapidly the basement where there many more works we had yet to see. I think I will certainly come back here in the future, when the crowds have diminished a little, if only to mount the stairs to the little room where the Cezanne paintings are and to gaze out across the Parisian skyline. Reading Victor Hugo’s "L’homme qui rit"